More and more content is being produced from inside a computer and the Senal Project Studio in a Box is a B&H Kit that delivers a compact solution for this type of workflow. The Senal Cardioid condenser microphone covers a lot of ground for live source recording, and is paired with a well equipped USB interface which goes beyond the usual stereo I/O scheme and offers twelve channel functionality (including digital I/O). Monitoring is via a pair of powered 4" speakers and a set of professional headphones is included. Designed to provide both professional and project studios a workhorse microphone that can be used in a wide variety of applications, the SC-550X Professional Cardioid Condenser Microphone from Senal boasts a wide, linear frequency response coupled with a precise transient response and high signal-to-noise ratio for accurate sound capture. It has a high SPL handling of 140 dB, and is at home not only in front of vocalists, but for tracking acoustic and electric guitars, brass, strings, pianos, and overhead drums. Thanks to its cardioid polar pattern, the SC-550X has a generous pickup range while minimizing off-axis noise. A selectable -10 dB pad allows you to use it in front of particularly loud sources without distorting, while the selectable high-pass filter provides an on-board low-frequency roll off. 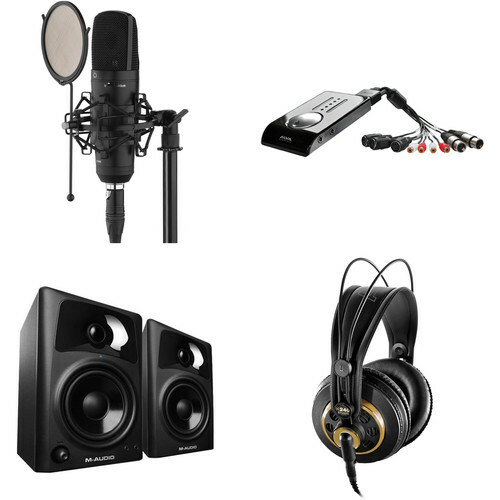 A shockmount, pop filter, and case are all included. The bus-powered and breakout cable equipped Alva Nanoface 12-Channel USB Audio/MIDI Interface affords an ideal combination of analog/digital connectivity, features, flexibility and mobility. It's the perfect tool for working musicians with a home or mobile studio. It also integrates seamlessly into a DJ setup or your home theater surround sound system. The Nanoface is equipped with a total of six audio inputs and six audio outputs. Plus, it's ultra-portable, weighs next-to-nothing, and is easy to operate. It even features a large multicontroller that facilitates simple adjustments and control over I/O features including management, monitoring and phantom power for microphones. The Nanoface was designed to work seamlessly with both Windows and Mac operating systems. Plus, it supports real analog hardware monitoring, as well as low latency drivers. The Nanoface really lives up to its name by hosting a variety of analog and digital interfaces. It supports dual RCA L/R audio analog inputs and dual RCA L/R analog outputs. It also features dual XLR analog mic inputs, which both come equipped with their own mic preamps, as well as phantom power. There's even a 1/4" Hi-Z instrument input and a 1/4" stereo headphones output. In fact, the stereo RCA outputs can even be routed through the stereo headphones output. The Nanoface affords a wide variety of digital connection points as well. These include a single MIDI input and dual MIDI outputs. There's also a digital optical S/PDIF input and a digital optical S/PDIF output. For any musicians or DJs that want to record directly onto their music production software of choice, the Nanoface features a USB 3.0/2.0 interface. This lets you use the Nanoface as a link between your analog or digital recordings and your computer. You'll easily be able to transfer any audio or MIDI data in and out of your Mac or windows computer - no matter if you're sitting at your desk or in the back of a tour bus. The Nanoface is designed to handle all situations. The USB 3.0/2.0 interface also doubles as the Nanoface's bus-power source, which means you won't need to drag around an external power supply. The Nanoface is free from any extraneous mixers or software option dialogs as well. This means it functions as a high-speed driver with most modern digital audio workstations (DAWs). All modern audio programs promote a low latency engine and an integrated mixer with plug-in support. Plus, they're also equipped with monitoring features. This allows the Nanoface to be as streamlined as possible. Plus, all device features are controlled by a single multicontroller called, the Encoder. With a wide variety of digital/analog inputs and outputs, a streamlined design and a single Encoder controller - the Nanoface promotes a simple learning curve and flexible usability for home musicians, road musicians, DJs and home theater aficionados with hi-fi surround systems. The rear panel of the monitors feature RCA inputs for connecting gaming systems, DJ gear, mixers and more. A front panel 1/8" (3.5mm) stereo auxiliary input allows for the connection of a laptop, smartphone, or other mobile device. A front panel 1/8" headphone output allows you to monitor directly using headphones. The monitors are suitable for a wide range of professional and consumer applications. Box Dimensions (LxWxH) 13.7 x 11.0 x 3.7"
Box Dimensions (LxWxH) 11.15 x 8.9 x 2.25"
Box Dimensions (LxWxH) 16.4 x 12.1 x 10.5"
Box Dimensions (LxWxH) 9.25 x 8.8 x 4.35"